Mobile Telephone: +353 (0)87 2376 481. Brookville House is family run Guest Accommodation offering a Real Irish Welcome, authentic Irish hospitality and friendly personal service from Liam and Dei. Here you will have a truly Irish experience, encounter Irish banter, the infamous Irish craic, learn a few Irish words 'Cupla Focal Gaeilge', be regaled with tales of old, explore Irish folklore, culture & heritage and perhaps encounter the resident Irish Leprechaun. We pride ourselves in our very high standards which results in a large number of recommendations and repeat business. In 2015 we were awarded a Booking.com Award of Excellence for 2014 and a Hotels.com Certificate for Exceptional Guest Ratings 2015. We have just notified that we are a Tripadvisor Certificate of Excellence 2015 winner, this is the fourth year we have received this award, having received a Tripadvisor Certificate of Excellence award in 2012, 2013 and 2014. We were ranked by Trivago as The Best Bed and Breakfast in Dublin 2014, an award we also held in 2013 and 2014. In June 2014 we received a number of top awards from Trivago including Trivago Top Hotel Dublin, Trivago Top Hotel County Dublin, Trivago Top Hotel Leinster and Trivago Best Bed and Breakfast Leinster. In January 2014 we received a Venere Top Clean Hotel 2013 award. In February 2014 we were delighted to learn that we had gained a Venere Top Overall Ratings Award for 2013. A big thank you to our wonderful guests for their lovely reviews and votes, go raibh mile mhaith agaibh. 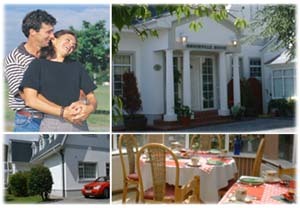 Brookville House Dublin is your Home Away from Home when in Ireland, arrive as our guests, leave as friends. We invite you to browse through our Website and hope we'll be welcoming you here in the near future. Brookville Guest House ; Brookville Park, Blackrock, Dublin City, Ireland.